Bluestacks Downloads	Vance Creek Railriders - Pedal The Rails! Thanks to Saint and Stan of King 5 in Seattle! 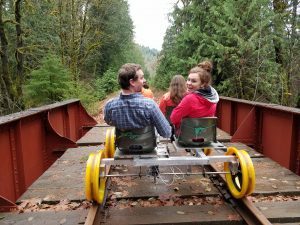 Enjoy the unique experience of pedaling the historic Simpson Logging Company Railway in Washington’s beautiful Olympic Peninsula. Nature enthusiasts, birders, cyclists, and rail fans are sure to relish the peace and tranquility of our trip. Help us protect the forest, Smoking is strictly prohibited while visiting the Railriders. We do not allow animals to ride with you on your adventure. Book early online for guaranteed seats, if available – tickets may be purchased on-site. The tracks trek through lush forest, crossing over and winding along Goldsborough Creek. Ferns and moss majestically skirt the tracks. Great for guests of all ages, with the youngest in car seats. Pedal assist from the guide is available upon request. Please read the additional details for this adventure below, and visit our Camp 1 to Shelton Trip page to learn even more about this trip. Please use a “Book A Reservation” button to book your reservation online. If you require assistance with our online reservations please email (our preferred contact method) info@vcrailriders.com or call between the hours of 8:30 am and 5 pm Monday-Friday (541)519-4200. Please leave a message if you don’t reach us, we will reply to your message during business hours. For Same Day Reservations Please call or visit us at least 30 minutes prior to your desired departure time. Reserved tickets have priority. Onsite ticket sales are limited to seat availability as our rides fill up fast. You may buy tickets at our departure site located at 421 W. Hanks Lake Road, Shelton, WA 98584 Or call 541-519-4200. Please leave a message if you don’t reach us. We will reply to your message during business hours. We are closed Tuesday and Wednesday. We are 8 miles West of Hwy 101. Please cross the tracks and turn at the second gate on the left for our parking area. If available; both same day and future tickets may be purchased at this location. This is a physical adventure. With a leisurely pace most guests are able to pedal the average .75% grade back up to Camp 1, with a portion of the rail at a 2% grade. However if needed we can provide pedal assistance, you will continue to pedal but the assist will lessen the challenge. It’s a good idea to conserve your energy on the ride down and pace yourself on your return trip. Setting a comfortable pace, pedal rhythm, and taking brief rests are key to keeping the return leg fun and enjoyable. You will be victorious upon arrival. Chidren under 12 yrs must be accompanied by an adult on their Railrider. Young children may not be able to provide much help with pedaling if their legs aren’t long enough. We can usually get them close enough to touch but not always to pedal. The typical age to be able to help is at least 6-8 years old depending on leg length. Smaller children who can’t touch or are known to be a wiggle worm are best to use a car seat. All of our Railriders seat 4 guests. Visit our FAQ page for answers to common questions. You are able to hang a small, light backpack on the back of your seat. Each seat has two cup holders that fit most 20 oz water bottles. Remember to bring water, weather gear (sunscreen, umbrella, hat, jacket, ponchos etc), a camera, and your adventurous spirit. CLICK HERE for specific details about this adventure and to learn more about things to see and do in Shelton. CHECK-IN: Please arrive 30 minutes prior to your departure and check in at our office. For lodging please visit our Contacts and Links page. We welcome large groups; families, business team building, special interest, schools etc. Visit our Reservation Info & Policies page for details regarding our reservation system and our cancellation policies.